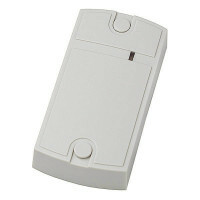 Matrix II MF-I RFID reader is designed for using in the network and standalone access control systems. Matrix II MF-I reader supports Mifare 13.56MHz keys and connects to the controllers via iButton (1-Wire) or Wiegand-26 protocol. There is a possibility of external control of visual and sound indication without additional connections. Matrix II MF-I reader supports both open (ID reading) and the protected (ID encrypting) mode for key data access. Protected mode of key ID transmission provides protection against copying and cloning. You may change the encryption keys unlimited number of times. Creating and writing of encryption keys must be performed by using of Iron Logic Object Card. Description of using in protected mode with Iron Logic Object Card can be found on the Iron Logic Protected technology description page.